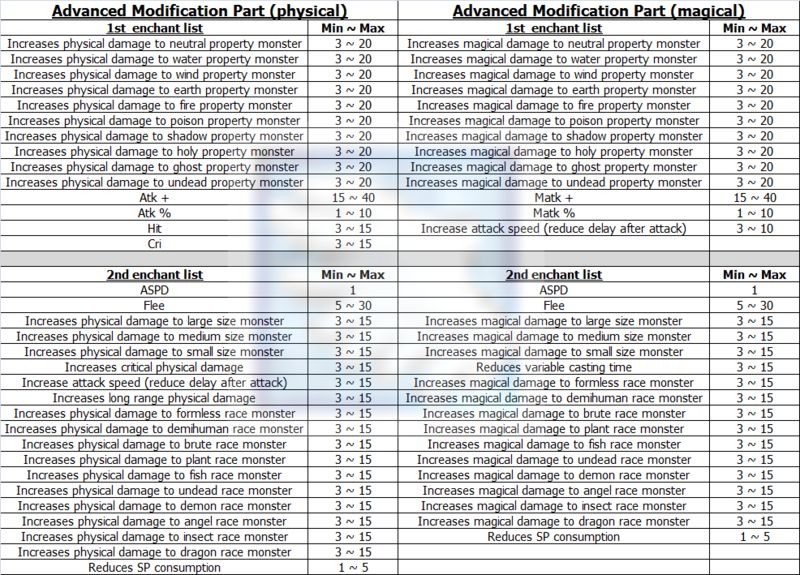 17.1 enchant info : Illusion equipment and OS weapons. Official page gives me nothing about enchant info. So I just collected info from inven board instead. When equipped with Illusion Engine wing ﻿B-type, reduces delay after skill by 10%. If refine rate is 7 or higher, reduces variable casting time by 5%. 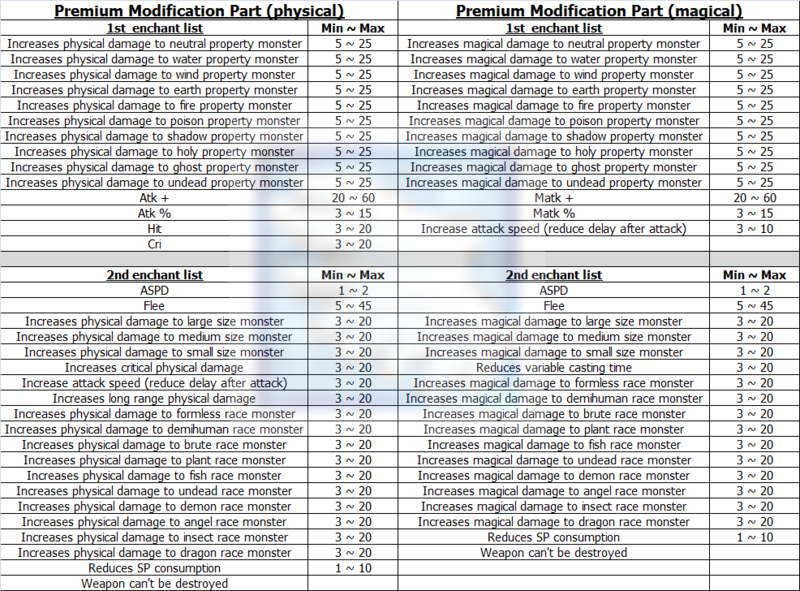 If refine rate is 7 or higher, increases all properties magical damage by 5%. NPC will give you Modification Module randomly. Legendary : Unlimited Vital, Spell Buster, Firing Shot, Overpower, Fatal Flash, Lucky Strike. 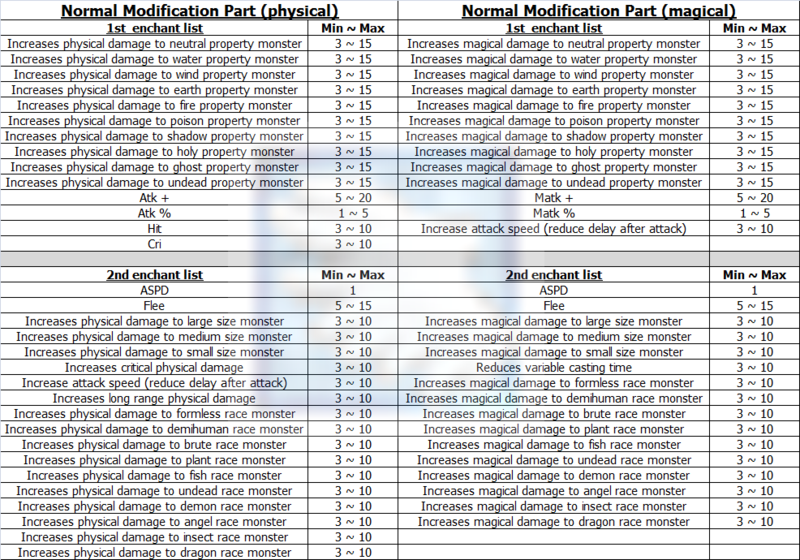 Grants Modification Orb (Fast) to equipment. Has a 2% chance to recover 400 HP per 0.5 second for 10 seconds when dealing magical damage. Has a 1% chance to recover 80 SP per 0.5 second for 10 seconds when dealing magical damage. Dex + 50, increases long ranged physical damage by 10%, drains 20 SP per second for 10 seconds. Agi + 50, increases critical damage by 10%, drains 300 HP per second for 10 seconds. Luk + 50, increases all property magical damage by 10%, drains 300 HP per second for 10 seconds. Usable Jobs : Swordsman classes, Novice classes, Thief classes, Merchant classes. There are 2 type of Weapon Modification Part, physical and magical. each type has 3 grades, normal, advanced and premium. The higher grade, the better enchant. this means exellion set is obsolote now? Optimism : You can wear Temporal Boots with Excelion set. How many enchants can a single equipment piece get? I'm assuming there are only 3 enchant slots per Illusion Equipment, like the Excellion Set here, correct me if i'm wrong. Also, I understand that you cannot get 2 of the same Legendary Enchant (as in 2 lucky strikes) in a single boot, but can 2 different legendary enchants (as in 1 Overpower and 1 Fatal Flash) be in the same boot, or just 1 legendary enchant per boot? Sorry that I don't mention about maximum enchants for single equipment. All illusion equipment can have 3 maximum enchants. And your concern has a point. In case of rare enchant of accessory. I've seen Illusion Booster with Attack Speed and Expert Archer enchants. So for the legendary enchant. I wonder as same as you too. Fortunately. Someone asked Gravity about stacking of legendary enchant too. 레전드 인챈트 1종류만 부여가 가능한 점 안내 드립니다. So only 1 legendary enchant is available for single illusion leg.